When it comes to camping, there are many levels of “roughing it.” Whether you want to cozy up inside a cabin, park your RV in the woods, or pitch a tent under the stars, you don’t need to drive far to do it. State campgrounds are typically the most affordable option and their scenery makes up for sometimes-limited amenities. Most are situated near communities with plenty of fun things to do. Privately owned campgrounds, however, have more freedom to offer fun twists, such as a taste of farm life or glammed-up amenities. Here are 7 options we like. The Manifesto of Low Expectations found on this retreat’s website is your first clue that this is a no-frills affair short on luxe amenities but long on nostalgia. Hernandez fell in love with Camp Wandawega as a child, when his family made a tradition of visiting. Now he makes new memories here, with wife Tereasa and daughter Charlie, age 5. The couple has been restoring the modest camp to the way Hernandez remembers it looked in the 1960s. Today it’s listed on the National Register of Historic Places. Regardless of the vintage ambiance, sleeping accommodations rarely involve tents. There are several sizes of cabins for rent, sleeping two to 24 guests, the larger ones often rented by groups. “We focus more on all-camp rentals,” says Hernandez. “They can take over the whole place and will be the only guests, so 25 to 50 can have the run of the place.” All rooms have vintage furnishings, shared restrooms, a communal kitchenette, parlor and showers. There are grills and smokers. Pets are allowed, but special arrangements must be made in advance. There’s a stocked lake with a beach, fishing pier and surrounding wetlands. 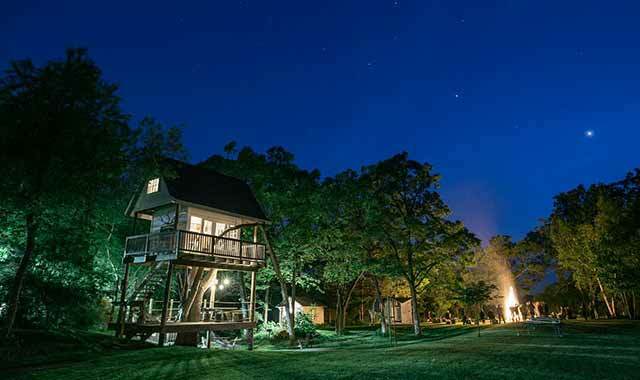 Guests may hang out in Tom’s Treehouse, the teepees or Tent Hill Cabin – authentic, vintage Boy Scout tents. Activities include boating, fishing, hiking, cycling, archery, and playing horseshoes, tennis or shuffleboard. Naturally, there are campfires with s’mores and singalongs. Every Sunday at 10 a.m., the campground hosts Catholic Mass, a tradition dating back to the early 1960s, when the property was owned by the Latvian Marian Fathers. “This was always a place where folks could reconnect to the simpler pleasures of a simpler time, and that’s something this world needs,” says Hernandez. Camp Wandawega is located at W5453 Lake View Dr., Elkhorn, Wis. Learn more and find the Manifesto of Low Expectations at wandawega.com. The family-friendly campgrounds at Marengo Ridge Conservation Area are nestled inside a scenic 818-acre forest preserve. Picturesque Thomas Woods offers 818 acres of open space, making it an ideal place for campers to spread out. There are miles of trails and a fishing hole. Favorite activities include seasonal hunting, hiking, cycling, ATV/snowmobile driving and cross-country skiing. The mature oak and hickory forest is home to many songbirds and other wildlife. Pets are permitted but must be on a leash and stay on the trails. “It’s a place for great stories around the campfire, with the sounds of the night adding to the experience,” Kummerer says. “Besides being really inexpensive, people love having a treasure so close to home. There’s always a campground host close by to help if you need more firewood, or anything. Thomas Woods in Marengo Ridge Conservation Area is located at 3100 N. Illinois Route 23, Marengo. Call (815) 338-6223 or visit MCCdistrict.org. Families that stay at Kinnikinnick Farm in Caledonia participate in the daily chores on this farm, which includes chickens, hogs, goats and produce. Spending time on Susan and David Cleverdon’s farm in rural Boone County is “like spending a few days on your grandparents’ farm,” says Susan. Many years ago, the couple left high-pressure Chicago jobs, purchased an abandoned homestead with many acres of farmland, and opened their hearts and farm to visitors. They grow and sell organic produce to some of Chicago’s top chefs; they also raise chickens and pigs for meat and eggs. Unlike traditional camping, there are no RVs or regular tents here. There are no camp counselors planning hourly activities, either. You don’t need sleeping bags, linens, cooking utensils or the usual provisions. The clothes you intend to wear, and a pair of boots, if you want to go into the animal pens, is all you need, says Susan. 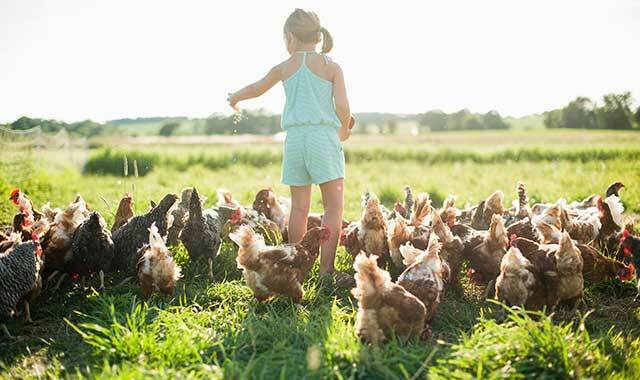 Roaming with the animals is encouraged and you can retrieve your own fresh eggs from the chicken coop for breakfast. Campers sleep in one of five canvas lodges that sleep six people. Each has a solid wood floor and a metal frame. The canvas may be rolled up for an open-air feeling. Each lodge has a master bed, one set of bunk beds, a cupboard bed, sink, wood stove, dining table with six chairs, water pump and an insulated wooden chest for cold storage. Guests can buy food on-site and prepare their own meals. On Wednesday and Saturday nights, they may bake their own pizzas in the outdoor pizza oven. Tents have neither electricity nor hot running water. Paraffin oil lamps, candles and flashlights are the main power sources. A cookstove is outside; hot water is available in the showers, located near the tents. There are no requirements to participate in the daily chore schedule, but many guests enjoy trying to milk goats or gather eggs. In all, the farm is home to free-range sheep, dairy goats, donkeys, Berkshire hogs, laying hens and hundreds of meat chickens. “Children enjoy spending time in the animal pens and hanging out with them,” says Susan. The farm also has a market, where guests are able to purchase an array of items, many produced on the farm. “We were eager to see if we could turn our passion for vegetable gardening, good food, and weekend country living into a rural livelihood,” says Susan. “We offer a wonderful opportunity for children and adults to spend time in a quiet, luxurious tent on a working farm, connect with nature, enjoy food that’s grown and produced on the farm, and connect with each other. Kinnikinnick Farm is located at 21123 Grade School Road, Caledonia. Call (815) 292-3288 or visit kinnikinnickfarm.com. Guests enjoy the cozy cabins inside Starved Rock State Park. The campground inside this state park dates back to the early 1900s and offers 133 Class-A premium sites with electricity and access to a bathhouse with showers and flush toilets. 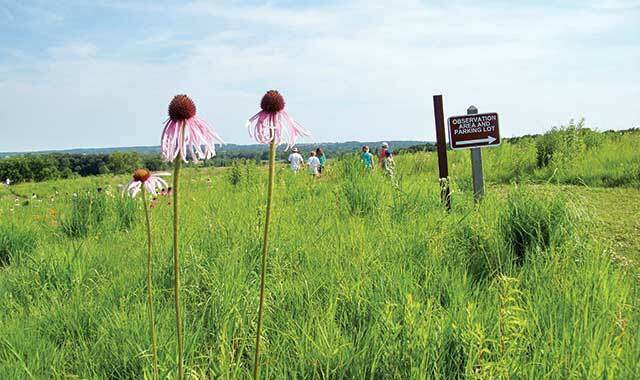 Aside from the scenic beauty and flourishing wildlife, people enjoy the way the park is laid out with open grassy areas conducive to pitching a tent, says Kerry Novak, park superintendent. Camping sites have standard 20- and 30-amp outlets. A limited number have 50-amp hookups for big travel trailers. Weekend reservations for the Starved Rock campground fill up fast, so plan ahead. “But, if you want to camp Sunday through Thursday night, you can pretty much walk up any time,” Novak adds. The park is located on the shore of the Illinois River, an ideal setting for fishing, boating and hiking the park’s 18 canyons. Visitors enjoy creature comforts found at the Starved Rock Lodge & Conference Center, which is privately managed but located inside the state park. The 75-year-old log lodge has many cozy rooms for rent as well as rental cabins, some of them pet-friendly. A two-night stay is required for some units if there’s a Saturday overnight. Both the lodge and many of the cabins were built by the Civil Conservation Corps (CCC) in the 1930s and the lodge is listed on the U.S. National Register of Historic Places. The CCC was a public work relief program that operated as part of the New Deal, to employ unmarried young men and improve government-owned parks across the U.S.
“Our sister park, Matthiessen, only a couple of miles away from us, also has really spectacular sites, with picnicking and horse trails,” says Novak. It allows equestrian camping only. Located southeast of Illinois Routes 71 and 178, Starved Rock is a short drive from Ottawa, Utica, LaSalle and Peru, which have shops, restaurants and wineries. Starved Rock is located at 2668 East 873 Road, Oglesby. Learn more at starvedrockstatepark.org or starvedrocklodge.com. Make camping reservations at reserveamerica.com. New Glarus Woods State Park, New Glarus, Wis. This state park is nature in the raw. The 431-acre campsite is mainly for tent camping and offers few conveniences – no running water, electricity or RV dump station. Its primitive nature is what makes this an enticing getaway, says John Arthur, natural resource property supervisor and team leader of five state properties. New Glarus Woods does have restrooms, a playground, picnic tables, fire pits and firewood for sale. A few pull-in spots are available for pop-up and small recreational vehicles, and campers can borrow handcarts to carry equipment to remote campsites. Nearby Swiss-founded New Glarus is a hotspot for visitors, especially bicyclists. The state park’s trails lead to the town, which is the starting point of the Sugar River Trail. 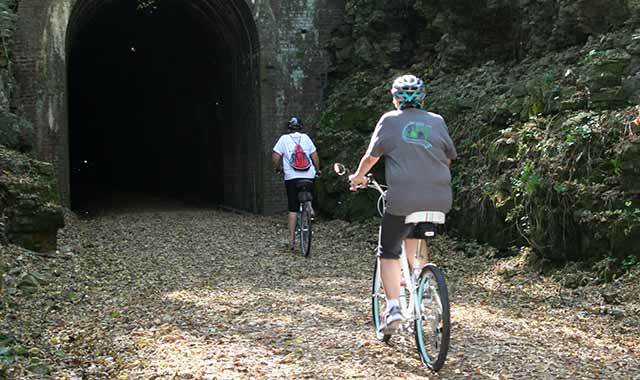 This crushed limestone rail trail runs south toward Brodhead, Wis., and intersects with the Badger State Trail, which runs through Monroe, Wis., on its way from northern Illinois to Madison, Wis.
“Bikers like it because it’s quiet and in a mature hardwood forest, too,” Arthur says of the Sugar River Trail. Natural prairies, rolling hills, creek beds, ravines, farmland and wildlife are among the pleasurable sights along the way. The route is suitable for walkers and joggers, too, and, in some stretches, for inline skaters and cross-country skiers. The campground has staff available on Fridays and Saturdays; self-registration is available the rest of the week. New Glarus Woods State Park is located at W5446 County Highway Nn, New Glarus, Wis. Learn more at dnr.wi.gov or call (608) 527-2335 to make reservations. Gathering at the barn to watch a sunset is a favorite simple pleasure at the Rustic Barn Campground & RV Park in Kieler, Wis.
Rustic Barn Campground & RV Park, Kieler, Wis. The couple married 38 years ago and traveled by RV for 22 years before opening Rustic Barn, located 7 miles from Dubuque, Iowa and 17 miles from Galena. It’s a short drive from Mississippi River bluffs, which are ideal for boaters and fishermen. 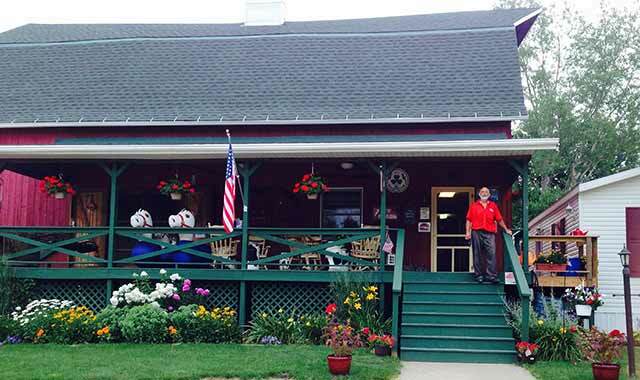 Campground guests like to gather on the porch of the property’s namesake red barn. Also facing west is a small, historic log chapel, where the doors are always open. All sites have full hookups, patios and fire rings. Guests share recreational facilities like horseshoes, a game room and a playground. There are clean restrooms and showers, laundry facilities, RV supplies, ice, groceries, firewood, Wi-Fi and winter storage. The Loafin’ Room is another gathering place for watching TV or socializing. An on-site market is well-stocked and a wall of brochures and maps helps guests to navigate the many local attractions. “Retired people come in for a night or two and end up staying four or five – it’s just incredible,” says Murphy. “A great deal of our success comes from keeping things neat and well maintained. “After a career in property management, and plenty of RV camping, I thought it would be nice to sit on a porch and run a camp … but I haven’t sat on a porch yet,” he says with a laugh. Rustic Barn Campground & RV Park is located at 3854 Dry Hollow Road, Kieler, Wis. Learn more at rusticbarnrvpark.com, and call (608) 568-7797 to make reservations. 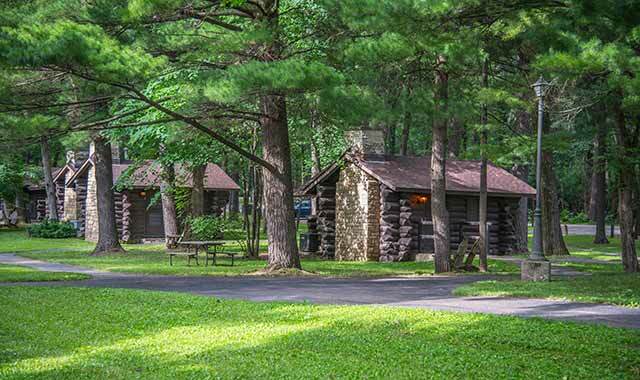 Choose from among several cabins and campground sites at White Pines State Park. 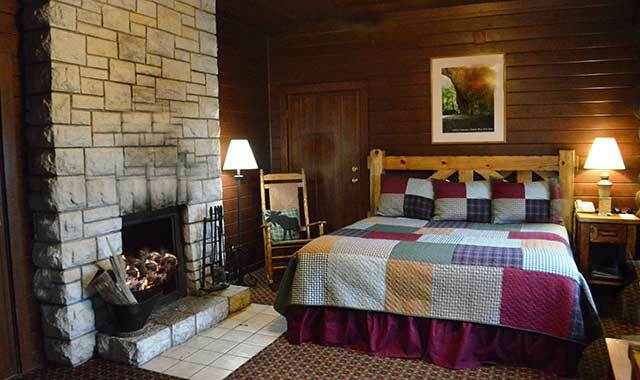 Located inside White Pines State Park in Ogle County, this inn provides many options. For nearly three decades, owner Beth Henderson, with husband Dennis, has provided a home-away-from-home for countless guests. From honeymooners who stay in the newest cabin to corporations holding retreats in the Pine Creek Cabins, all guests are immersed in 385 acres of pristine wilderness. The park’s elevated landscape, limestone outcroppings and concrete fords, which allow visitors to drive through the flowing streams, add to its splendor. Campers find 103 Class B/S campsites, three with electric hookup. All sites have access to showers and flush toilets. For something a bit more posh, 25 authentic, one-room log cabins, built in the 1930s by the CCC, like Starved Rock Lodge, are a good choice. Spacious Pine Creek Cabins, adjacent to the park, are available year-round. Each has a full kitchen and living room. They’re outfitted with log furniture, firepits and grills. The largest cabin sleeps 12. Canyon View, Henderson says, is a captivating private getaway for two, ideal for honeymooners. Its amenities include a log bed with linens, a Jacuzzi tub, two-person shower, gas fireplace, and kitchenette with dishes, microwave, refrigerator and coffeemaker. The cabin also comes with free Wi-Fi and a flat-screen TV. Add-on packages must be planned in advance and can include wine and roses or a massage at Canyon View Spa. The rustic lodge at White Pines has a popular restaurant and stages more than 100 live dinner theater productions annually. White Pines Inn is located at 6712 W. Pines Road, Mt. Morris. Learn more by calling (815) 946-3717 or visitingwhitepinesinn.com for an online tour. This entry was posted on Friday, July 29th, 2016 at 11:58 am	and is filed under Features, Top Posts. You can follow any responses to this entry through the RSS 2.0 feed. Both comments and pings are currently closed.